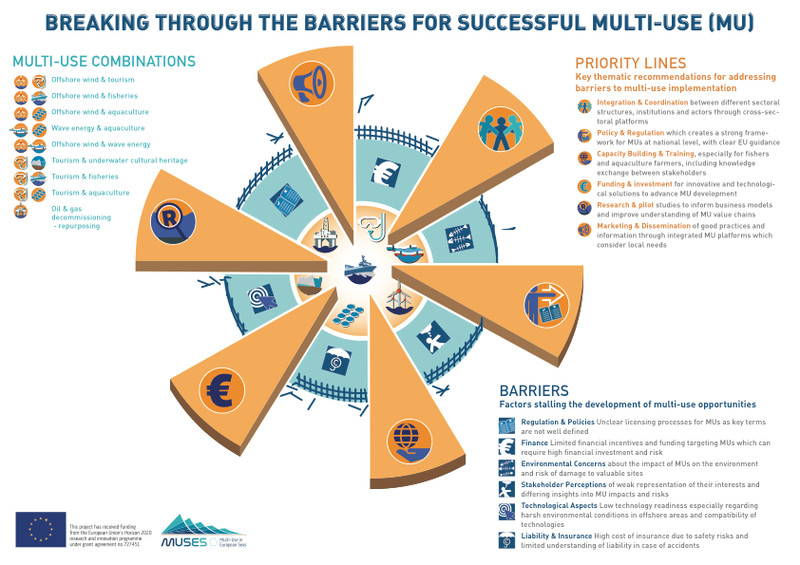 The EU wide Ocean Multi-Use Action Plan sets out the various actions and recommendations that can be taken at different levels to promote multi-use in European Seas, including those related to integration and coordination, policy and regulation, maritime spatial planning, dissemination and promotion, funding, capacity building and research. The Action Plan was developed based on a systematic review of MUs experiences and opportunities as well as through engagement with stakeholders at European, sea basin, country and (local/sub-national) case study levels. What is Multi use of the ocean? What are the drivers/added values, and barriers/impacts of Multi-Uses? What are the recommendations and actions to advance Multi-use of the ocean? Which actors are responsible for advancing particular actions and recommendations? The Maritime Spatial Planning Directive requires all EU Member States (MS) to develop Maritime Spatial Plans up to 2021 and thus to strategically consider the best location and conditions for each use. In doing so, MS are invited to seek not only best available data and broad public participation, but also consider opportunities for co-location of maritime activities. Provides recommendations for future action, considering national, regional and sea basin dimensions. Analysis of Focus Areas: Case studies were further analysed through key questions including addressing MU development potential, boosting the blue maritime economy and improving environmental compatibility. 4. The final step comprised the integrative analysis of findings at the sea basin, national and case study levels which generated a large number of recommendations and actions. Additional consultations with stakeholders (via interviews and work- shops), as well as their review of the draft action plan, allowed for the finalization of the project’s final output. Part 1 - introduces the MU concept, its policy background and the MUSES methodology. Integration & Coordination: MU as a concept is still novel for MU involved actors who must adjust to policy, planning, consenting and management reform in order to advance synergies between maritime uses that are usually managed under different sectoral institutions and owners. Integration and coordination may be achieved by setting up cross-sectoral platforms to guide the development of MU, involving continuous stakeholder engagement, exchange of knowledge and integration of new MU actors. Maritime Spatial Planning: Current MSP processes offer an opportunity for planning authorities, together with stakeholders, to use existing evidence to identify suitable areas and comprehensive policies promoting MU, especially for new joint developments. Policy & Regulation: Clear direction and guidelines from the EU and the responsible directorates are needed for integrating operational issues about MU into EU and national policies. An indication is provided of how Member States can adapt their institutions and regulations for MU implementation to advance MU. Promotion & Dissemination: Promoting good practices and disseminating information about the economic and societal benefits of MUs through existing regional and sea basin forums and networks is necessary to facilitate its replication and encourage investment. Funding: Targeted incentives for MU are needed to advance its implementation, while existing funding schemes directed towards single sectors should be adapted to consider MU. Funding should also support those small scale or local MU solutions that may not have a high contribution to the national GDP, but may render important socio-economic and cultural benefits for the local communities. Research Priorities: Identifying research areas and undertaking pilots in the real environment led by research centres would allow the development of full-scale business models; enhance understanding of the MU value chain and the opportunities that it presents; and generate recommendations for advancing MU. The Action Plan and recommendations are based on an EU wide research and stakeholder engagement, which also considered sea-basin specificities and hints from the case studies level. The analytical framework and methodology used in the development of the Action Plan can be applied to MSP since it considers similar themes such as integration and coordination, stakeholder participation, capacity building, marine licensing and regulations among others. It can also be applied in other non-European sea basin; however, it is important to carefully consider local conditions and factors when deciding on its use in selecting which multi-use combination can be considered during the MSP process. Recommended actions provide by the Action Plan are aimed to concretely advance MU implementation. Among these, the role of MSP in promoting a shift from sectoral approach to MU opportunities is highlighted.